Actually the sun sign seems to be on all our notes in NZ. I don't like the feel of the reversed pound symbol, how strange is that? Great article - I got here through Wise Woman. 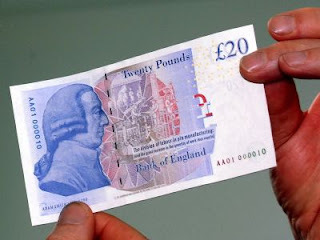 Adam Smith also appears on one of the Scottish banknotes which makes him a 1st on 2 different countries. The PIN interpretation - I guess it reminds how important it is to make a little sacrifice and work for min.wage in a senseless job that could be done by machines. I have my electronic passport with its heavy accent on BIRDS. One of Darwin's Finches grace the electronic page. WW, the anti-forgery story IS ridiculous. It's just the bait in the trap. They do this all the time. They find some benefit, whether real or not, and hype it up in the media so that we support wht they're doing. Many people are in favour of tagging people on probation from jail. Reasonable you might think? Well no because the prisoner programnme can then be expanded into a scheme that tags evereyone else! I rememeber how the Chip+PIN bank cards were supposed to be the last word in fraud pevention. Well the first cloned cards were coming out before the new cards had replaced all the old ones! Thanks, Aferrismoon. 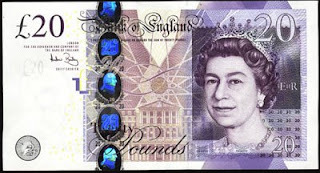 The so-called unforgable banknotes are as unforgeable as the Titanic was unsinkable! But the govt don't care. As yuo say, there's a bit of propanganda involved in the pin story. the new robot economy which is seen as wonderful to be a part of. It makes you "hard-working"! My site has a lot of completely unique content I've either written myself or outsourced but it looks like a lot of it is popping it up all over the internet without my authorization. Do you know any techniques to help reduce content from being ripped off? I'd really appreciate it. Generally I don't read article on blogs, however I wish to say that this write-up very pressured me to check out and do it! Your writing taste has been amazed me. Thank you, quite great article. to start my own blog in the near future but I'm having a hard time choosing between BlogEngine/Wordpress/B2evolution and Drupal. The reason I ask is because your design and style seems different then most blogs and I'm looking for something unique. It's not my first time to go to see this site, i am browsing this web site dailly and take pleasant data from here every day.